4. Just kills mosquitoes, flies, gnats, and all flying insects on contact. 6. It can be used indoors and outdoors. 7. Light weight, convenient and easy to carry. Charge the Swatter 2 to 3hours before use. Hold the handle and turn on Power (main) switch. Then press the Hitting switch button located on the side of the swatter till the indicator light is on and wield it to make insects touch the net surface. Turn off Power (main) switch when the Swatter is not used in order to reduce the free consumption of the batteries. 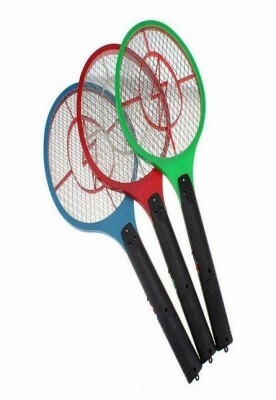 Recharge the Swatter when Discharge becomes faint and the light is weak. When the insects are killed, just release the button and brush or shake off any insects on the nets surface. Please do not wash it with water to avoid short circuit. Note: Keep power button OFF racket off at the time of charging.